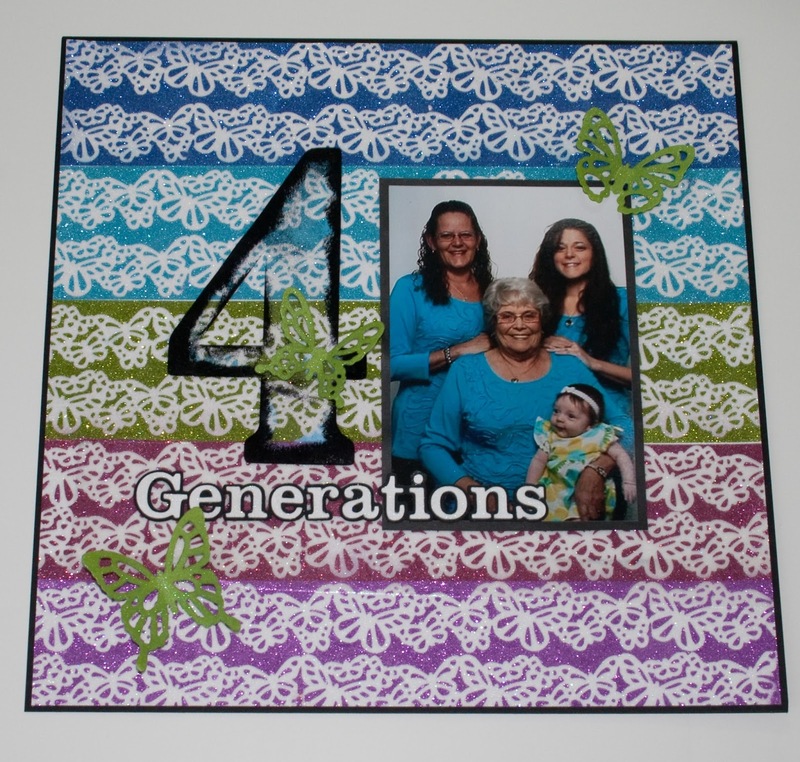 Here is a scrapbook page I made of a customer at the Sparkle N Sprinkle store. 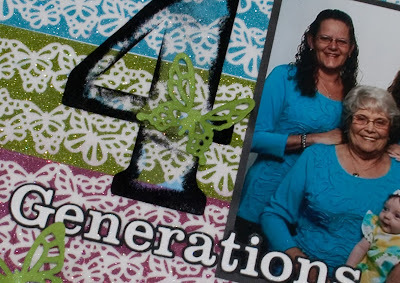 She was showing us this generation picture and I thought it would be a great scrapbook page and asked her if she could send me a copy of the picture. I ended up laying strips of the 2 1/2" Tear-ific Tape on my white 12 x 12 cardstock, then peeled off one of the release papers and used the Martha Stewart Punch and got 2 rows of punches out of a strip, then put the butterflies back down on the tape and covered with Velvet Glitter, then removed the butterflies and added Cloud Nine Velvet Glitter. Then when I got done with all that sparkly goodness I didn't want to cover it up any more than I needed to, so I cut the big 4 out of Embossable Acetate on my Pazzles then edged it with Versamark and Black Detail EP. Love the way you can still see through it and the four stands out nicely. 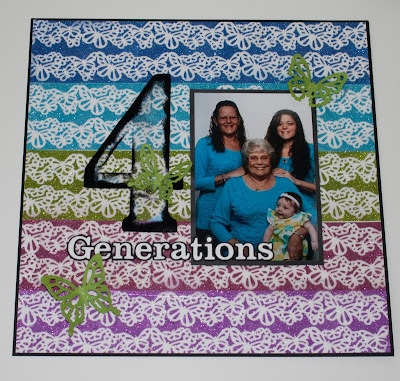 The "generations" was to small to do the same thing so I just cut out plane white cardstock and embossed with Velvet Sparkle then layered it on black. I like the subtle sparkle of the Velvet EP. The butterflies were cut out with the Spellbinders Wonderful Wings and also embossed with the Velvet Sparkle EP. Hope you get some time to play this weekend.